Pie brings people together. It's one of those special treats that are usually reserved for holiday gatherings or welcoming a new family to the neighborhood. Perhaps what necessitates pie for these sorts of special occasions is the fact that every slice is cut from the same whole, thus signifying unity. Another great quality of pie is the fact that you can put just about anything in one. From savory meats and veggies to tart fruits and velvety creams--there's no end to the versatility! 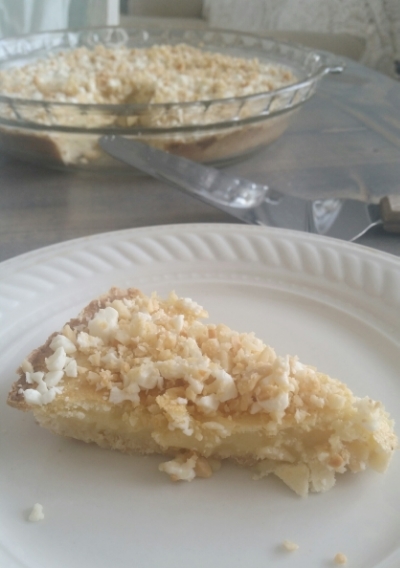 Take for example this White Chocolate Macadamia Nut Pie: it is filled with the ingredients of a beloved flavor of cookie, and it is equally as delicious (maybe even more so). To begin, preheat your oven to 350° F.
Place all of the ingredients in a medium bowl and mix them up until course crumbs form. I used my hands to squish the butter into the dry ingredients until the mixture looked even, but you could get your standing mixer or food processor dirty doing this if you want to. Pour the mixture into an 8-inch pie pan and use your fingers to pack it in tightly on the bottom and around the edges as much as possible. Put the pie pan in the oven and bake for 8-10 minutes. While the crust is baking, go ahead and begin on your filling. Pour the whole milk and sugar into a small sauce pan and place on the stove at medium-high heat. Stir the sugar into the milk and let the mixture simmer, stirring occasionally, for 25-30 minutes. The mixture should condense down from 1 cup to 3/4 cup, but it will not be super thick just yet. Once your milk has simmered for the proper amount of time, preheat the oven to 350° F again if you need to, and then go ahead and transfer your milk mixture to a medium glass bowl while it's still hot. Add the white chocolate and the flour to the milk mixture a little at a time and whisk until everything is combined and there are not visible lumps. Whisk in the egg and the vanilla. Pour the mixture into your pre-baked pie crust and place it back in the oven for 20-25 minutes. When the pie is done baking, it should be slightly browned on top, and it should not jiggle when shaken. Remove the pie from the oven, and sprinkle the chopped chocolate and nuts over the top of the pie until it is completely covered. Leave the pie to cool for 10-15 minutes. Then cut a slice and come back here to leave me a comment either thanking me for introducing this wonder to your life or cursing me for making you eat an entire pie in one sitting.